The Aurora Ice Hotel, made entirely of ice, had a short-lived existence, but the Aurora Ice Museum that replaced it is just as cool. If you're really looking to get away from it all and have a one-of-a-kind experience, head 60 miles north of Fairbanks, Alaska, to the Chena Hot Springs Resort—the home of the museum made of all ice. Built in 2005, the museum uses geothermal technology to keep it at 25 degrees Fahrenheit (7 degrees Celcius) all year, despite summers which can reach more than 90 degrees. It took more than 1,000 tons of ice and snow to create the museum, which resembles a church. Inside you'll first notice the ice crystal chandeliers that change colors to depict the Aurora Borealis, also known as the Northern Lights. Features of the museum include a two-story observation tower, kids' fort, jousters on horseback, a giant chess set, a Christmas tree bedroom, a polar bear bedroom, an ice outhouse, and a wedding venue. In the museum's gallery, admire the amazing ice sculptures made by world-champion carvers Steve and Heather Brice. Don't worry about getting too cold while in the museum—parkas are available for free. Bring your own hat and gloves, however. Purchase tickets in the Activity Center 15 minutes before the start of the tour. The activity booking desk is open from 9 a.m. to 9 p.m. daily. The Aurora Ice Museum is open every day with tours at 11 a.m., 1 p.m., 3 p.m., 5 p.m., and 7 p.m. Image courtesy Chena Hot Springs Resort. When you're done touring the ice museum, chill out in the Aurora Ice Bar. If you're 21 or older, make sure to pre-purchase an "appletini" when you buy your tour tickets. The drink comes in an ice-carved martini glass. It may be cool, but the caribou fur-covered stools and fireplace will keep you warm. The resort was discovered in 1905 by two gold miners, and although it maintains its rustic charm, it's also thoroughly modern. Its natural surroundings are gorgeous, and it's ideally located for watching the mesmerizing colors and movements of the Aurora Borealis. Seeing the light display is a bucket-list item, and the best shows take place between 10 p.m. and 3 a.m. Watch them on your own or take a viewing tour offered by the resort. Other resort activities include relaxing in the hot springs, getting a massage, or sipping a drink at the ice bar. You can also take the geothermal renewable energy tour, which explains how the ice museum is kept cool. Other activities include ice sculpting lessons, dog-mushing lessons, and flight-seeing tours. 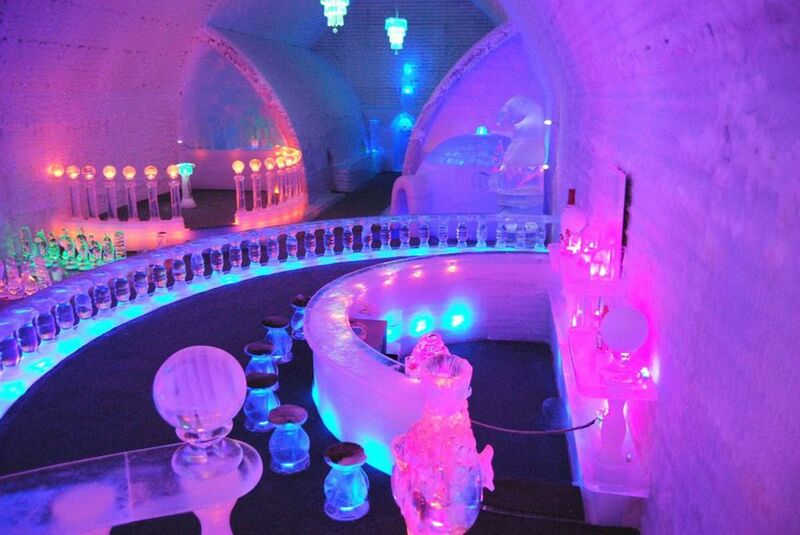 Chena Hot Springs Resort and its ice museum are open year-round to tourists. The resort offers many lodging options. Stay in the hotel, a cabin, or yurt. Tent camping and RV sites are also available. It's a good idea to make reservations. The resort is 60 miles north of downtown Fairbanks, Alaska. Take the state-maintained road to Chena Hot Springs Road. The scenic drive takes about an hour. Keep an eye out for wildlife—you may even see a moose.